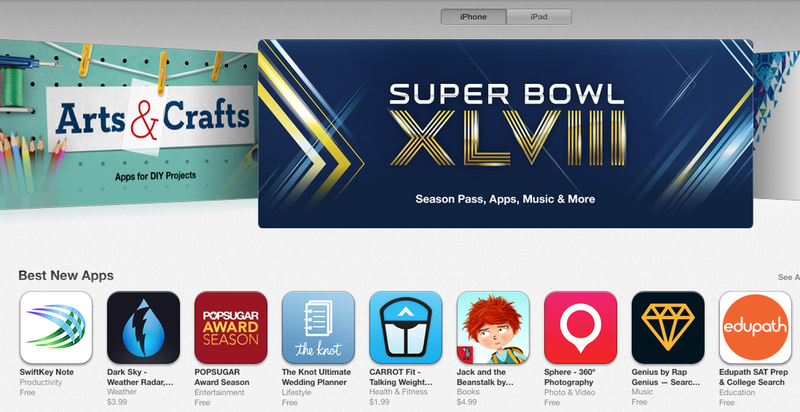 While the Super Bowl is still a couple of days away, Sphere won the Super Bowl of app recognition today. Sphere 360º photo sphere app is featured on the U.S. App Store home page among Top 10 Best New Apps. The Sphere 360º photo sphere app is featured in the Best New Apps category on the Apple iTunes Home Page in 24 places 'round the globe today, according to App Annie. Sphere updated its multi-award winning app (v3.5) Thursday (30 January 2014) to include enhanced 360º spherical recording in "Easy Mode" and "Pro Mode" – free! 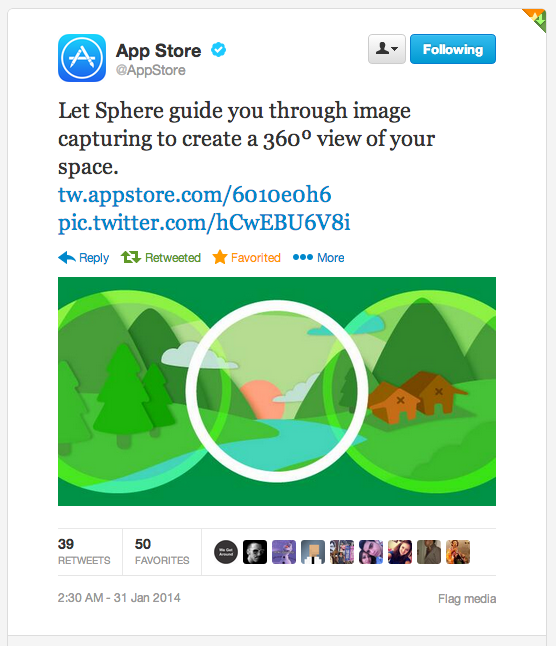 @AppStore tweet sent today about the Sphere 360º photography app to its 2.4 million followers. Using the Sphere app to record 360º photo spheres is a great way to get started creating immersive, beautiful HDR virtual tour images for your business. When you're ready, take virtual tours to the next level, engage We Get Around to professionally shoot and host your 360º photo spheres or DIY photo pro shoot with a free 360º photo sphere camera with a We Get Around pre-paid hosting subscription. When you use the Sphere embed code in your website, an iPhone and iPad become movable windows, allowing prospective travelers or apartment renters to control their view as they teleport in to your residential or commercial real estate for rent or sale or hotel room or other destination. Last updated: 3:30 pm EDT Friday 31 January 2014. Disclosure: We Get Around Founder, CEO and Chief Photographer Dan Smigrod is honored to be a Sphere Advisor.